You are here: Home » News » Church » Remnant » Bride of Christ now being cleansed, purified, and made ready to walk in His Fullness! Bride of Christ now being cleansed, purified, and made ready to walk in His Fullness! I had no understanding of what He was referring to, so I prayed all the more earnestly. It was after three days that God breathed new life into my situation, and yet I still had no clear understanding of the work which He was doing. So I continued to pray and seek Him as this stirred greatly within my spirit. Days passed, and the Holy Spirit began to give further understanding. The Sign of Jonah (or Jonas as sometimes referred to in scripture) was referenced by Jesus when the Pharisees and Sadducees demanded a sign as proof of who he said he was. Jesus rebuked them, saying they were a wicked and adulterous generation, and that only the sign of the prophet Jonah would be given them. As Jonah was in the belly of the great fish three days and three nights, so would our Lord Jesus be buried and spend three days and three nights in the belly of the earth. After the death of Jesus, his body was anointed with myrrh and aloes before being placed in the tomb. The account of Esther pointed to the death of our Lord Jesus. She assumed the “position of death” by saying, “if I perish, I perish.” Then for three days and three nights, she and all of Israel fasted and prayed to God for their deliverance. Esther had been anointed with myrrh for six whole months in her purification process prior to being brought before the king! Myrrh was also used in the anointing oil for the tabernacle, and poured upon all objects and the priests who ministered within it! Primary uses for myrrh include: perfume; anointing oil; purification; and embalming. I believe what is being shown here is, just as Jesus was led to the Garden of Gethsemane to completely surrender his WILL to the Father, so must the Bride of Christ allow herself to be led to her own Garden. So, we must surrender our WILL, with all the earthly desires of our flesh, to a spiritual crucifixion. Just as the body of Jesus was anointed with myrrh for cleansing, purification, and in preparation to be brought before the Father; so does myrrh symbolize the purification process of the Bride as she dies to self. She will be cleansed and purified in preparation of her ultimate union with the Bridegroom. As Jesus was buried in darkness for three days and three nights, I believe the Lord is showing His Bride, after allowing her flesh to be crucified during her garden experience, will also be “hidden away” for such a time. During this “hidden away” time, she will be cleansed, purified, and made ready to walk in His Fullness! I believe just as His Perfect Love literally exploded life into the cells of His Son in the tomb, soon every cell in our bodies will awaken and explode with His Life! The last time God poured out His Perfect love, He raised His Son! This time, He is going to raise up the very Body of Christ, the Bride!!! God willing, ‘From Eden to Gethsemane’ will be posted within the next few days. John 19:38-40, “…And Nicodemus, who at first came to Jesus by night, also came, bringing a mixture of myrrh and aloes, about a hundred pounds. Then they took the body of Jesus, and bound it in strips of linen with the spices, as the custom of the Jews is to bury. William Thompson first heard the audible voice of God speak to him in May, 1986, while intoxicated. Being raised an atheist, this was quit shocking. After hearing Him speak, he was given a glimpse of the Lord seated gloriously upon the very Throne of the Heavenlies. 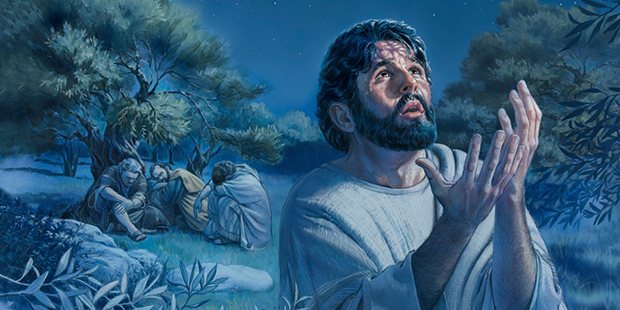 After receiving the gift of His only begotten Son as Savior and Lord in June, 1986, and the baptism of the Holy Spirit February 22, 1987, the Lord told William he was called to be His prophet of rebuke and judgment. Shortly thereafter, the words, dreams, and visions began. He’s lived for Him since that time, declaring the Lord to be his whole life and love. Ohhhh, wow! Confirmation! I too have been going through purification. The Lord has been showing me, 3 Days and crossing the Jordan to the promise land. The Lord led me to read about about Esther 3-Day fast to be delivered from the spirit of Haman, the spies Joshua sent into Jericho spent 3 days hidden while their persecuters were gone, Israel waited 3 days and consecrated themselves before crossing the Jordan…. Amazing how God has been showing to you various things concerning a 3-day period! And, yes, He does give to each of us some part so that we can work together to “connect the dots,” so to speak. This helps us to encourage one another and confirms what He has been showing us. And that time period is so very important to prepare us for a work in us by bringing us past ourselves and laying all things at His feet. We must surrender our will before Him just as our Lord Jesus did! This is everything that is within us, our desires, our habits, our preconceived ideas, our plans, etc. We must allow God to lead the way and only then will He pour out His glory to fill us with His power! Amazing how the Lord is showing us different aspects of one message! Dear bro in CHRIST, Br Sadhu Sundar Selvaraj will be preaching in Ohio from 1st-3rd December, kindly let us know the word that God releases for America there tomorrow. Also he will be on Br Jim Bakker Show live on 4th. If anyone is in Ohio region, kindly do attend those meetings. Mandeep – thank you so much for bringing this to our attention. I didn’t know he was coming here, and live 20 minutes away. My seats are now reserved. My deepest Thank you for your alerting all of Sadhu Selvarajs itinerary in Ohio and at Jim Bakkers in Mo. Because of you I was made aware and attended Jim Bakkers on Monday.Thank you, I otherwise would not have known. Sadhu is such a special person,Prophet and truly a friend of God.They taped the show live and have it made it available…also it will be airing on Jims show in a week if I am correct…Thank you again Mandeep,I was truly honored by being able to attend. All glory to Lord JESUS CHRIST dear Sister.I have done nothing. This is Gods’ love for you. I am so happy for all those who could make it to the meetings. Kindly do share or mail me the prophecies shared by dear Prophet of God. He is like modern day Enoch and Moses caliber by God’s grace. I will be honored if you share the prophetic insights regarding America and Israel if any the Prophet shared. Away, away they turned their back on the Mastermind. I’d welcome all my prodigal sons with wide open arms. Yet in Their image was he which he will one day reclaim. For there will be such rejoicing when you finally do amend. Please, please do come back! This truly is a wonderful time but we must be diligent before God and keep our eyes fixed only upon Him! This is so very crucial if we are to continue in His strength and not be overwhelmed by what is going on in this world! The enemy has been focused and steadfast working on his plans and we have been so very distracted. But God the Father is wooing us to draw closer to Him, surrender our will and desires before Him so that He can do a greater work in us! This, in turn, will give us the victory for His glory! Remain in the secret place! So true William! The work in us will make all these times bearable, not just bearable but exciting. I also agree with brother Michael Perritte the secret place is the secret, keeping us fixed on Jesus. Thank you for those whom share those precious moments with Father on z3news. Phew!!!!! I really thought you meant a whole ‘nother year!!! The symbolism of a time of myrrh is very powerful. People have associated it with weeping and loss and mourning because it is used to anoint dead bodies, but, amazingly enough, myrrh is also referred to as the oil of joy and Jewish Brides are anointed with it on their wedding day. So the Bride of Christ being anointed with myrrh is very significant. It means we are in the morning watch (when the Bride took her mikvah or ritual cleansing bath) and the wedding day is here. Chemically, myrrh kills bacteria and myrrh was also use don the battlefield in ancient times to attend to wounds so they would not get infected. It’s seems Hebrews 12:27-29 addresses this head on. I especially appreciate the wording in The Message for this passage. Before there can be an awakening there must be a cleansing of the church removing all the clutter. As Tozer states, what we think about God is the most important thing about us. Our God is a consuming fire. He is consuming all that is in us that is not of him. Then he can empower us for the last great harvest. Please pray about and do some research, this is one of the areas that I believe satan has deceived many in the church. Hi Lynnne I greatly appreciate your concern and conviction as a sister in the Lord. There’s something I do almost every night when it’s clear. I look up at the stars above and glorify God knowing that he’s the one that holds it all together both in the heavens and the earth or above as below. Just because the occult uses that terminology doesn’t mean it has to be robbed from me as a believer just as the homosexual community uses the rainbow. Does that mean I can’t admire and respect the rainbow that is my Father’s..?? Absolutely not! So as much as I respect your response I can recognize that the true and living God is above all else and myself and the earth is most definitely below. Blessings! Sorry for the typo…the choice was Yes or face death. On 3/16/17, I recorded in my journal the following word from the Lord: He said, We must go through our “Gethsemane” to prepare for what lies ahead. Matt. 26:36-37. I also will share in another post a dream the Lord gave me several years ago about the preparation of his Bride. It is a confirmation of everything spoken here. So grateful for everyone’s post..it gives us a clear picture of what God is saying to His bride. Do you think this is the same time as the 3 days of Darkness? Although we are crucified in Christ and die daily, I feel the Lord is showing there will come a time when, “Each of Mine will go through the Garden.” This will be a time when we completely empty ourselves, surrendering ALL our will – everything to Him. I believe this will be right before the “3 days of Darkness.” Each of us as part of the Bride of Jesus will then be hidden away for a brief time as we are transformed and filled with His Glory. We will then be sent forth to walk in all His Fullness for a short period. How do you know when this time of entering the garden etc. is to take place? The garden is your own personal place of travail and crucifying the flesh to surrender to His will. It is great trial and fire. You will know when you’re there. Diana has an article explaining on her site. Brought a lot of clarification and revelation to me.